“What is cognitive-behavioural hypnotherapy?” Cognitive-behavioural hypnotherapy is an evidence-based, solution-focused collaborative process that combines CBT with hypnosis. It is a safe procedure that will not cause you any harm, and it has a proven track record of success for the issues I offer help with. “What does hypnosis feel like?” For many people, the hypnotic experience feels somewhat the way you feel on the threshold between waking and dreaming. You may feel some unusual warmth or a slight tingling in the hands or feet, or perhaps you will feel heavier or lighter than usual, or you may feel lightheaded. Time distortion and partial amnesia are also common. But not everybody experiences all or even any of these sensations. “Does hypnosis induce a state of trance?” Hypnosis is essentially a state of mental absorption. Whether you will be ‘in a trance’ or not really depends on what school of thought you adhere to. Some say that when you are in hypnosis you are in a physiological ‘state of trance.’ There is increasing evidence that any hypnotic phenomena we experience in hypnosis are due to what is essentially just a cognitive state of focused attention and the heightened suggestibility that naturally comes with that. Try closing your eyes and see how that act in itself encourages an inw ard focus where things on the periphery becomes less important. Notice how that feels. If you like to think of that as a state of trance, then that’s fine. You may then also think of losing track of time while being engrossed in a book, daydreaming while looking out of the window, being lost in thought while driving a car or riding in an elevator as states of trance. I like to think of those experiences as hypnotic, without necessarily labelling them as ‘trance’. Most of us naturally go in and out of such natural hypnotic states several times a day. Because you normally become very relaxed when having hypnotherapy, this allows your unconscious mind to more deeply absorb helpful suggestions that it can then choose to agree with on a much deeper level than it normally would. This is how unhelpful automatic thoughts and core beliefs can be replaced with more helpful ones. Typically there are 4 distinct phases to the hypnotic process: the induction of hypnosis, the deepening of hypnosis (which causes the so-called ‘trance’), dealing with the dominant idea while under hypnosis, and emerging from hypnosis. “Will I be reprogrammed?” A popular metaphor with hypnotherapists is the one where the human brain, respectively the unconscious mind, is likened to a computer hard drive with many files on it than can be erased or modified and recorded over. This is, of course, only partially correct. It is overly simplistic, and to some it sounds alarmingly reductionist. Of course, our brains are not really computers as we know them, since computers are not alive and do not have emotions. But the metaphor is helpful in many ways, as it is certainly true that humans have a tendency to rewrite their own history. To the extent that every one of us is the interpreter of their own experiences, we certainly can reprogram ourselves. Complete rewriting is neither possible nor (for reasons of personal integrity and identity) advisable, but we can certainly learn to reframe our memories and see them from a different perspective, just as we can adjust the lens through which we perceive the present and imagine the future. From an NLP (Neuro-Linguistic Programming) point of view, one would speak of becoming aware of and then consciously changing the sensory submodalities of one’s experience, i.e. how one perceives it. This is also one reason why I do not recommend regression therapy, particularly for traumatic memory recovery – the risk of having ‘false memories’ based on having suggestions implanted (unwittingly or not) is simply too real. This is the reason why court testimonials made under hypnosis are not acceptable in most countries. Hypnotic regression has been extensively tested as a means to get the truth out of witnesses but it has consistently failed. “How is hypnotherapy different from stage hypnosis?” As a therapist my mission is to help you achieve your goals. I am a facilitator, not an entertainer. Stage hypnotists use showmanship, stooges and social coercion techniques in order to entertain, and what happens on stage is far less magical than it may seem to the uninitiated. Provided it’s done respectfully there is nothing wrong with that but it’s a completely different world with a completely different agenda. “What exactly do hypnotherapists mean when they speak of the conscious and the unconscious mind?” The terminology is used more for convenience than for anything else. So far, science has been quite unable to pinpoint just what exactly the unconscious (or subconscious) mind is, or where to locate it. What we do know without a doubt is that there are unconscious processes, and they do indeed have a powerful influence on our decision-making and day-to-day living. Conscious mental activity is intelligent, analytical, conceptualising and logical with a narrow focus on everyday events, whereas unconscious processes are emotion-based, intuitive and fantasy-prone – it’s a non-judgmental storehouse of accumulated knowledge and experience, your identity deep down. Approximately 90% of our mental activity is unconscious.Whereas the conscious mind allows us to rationalise what we do and helps us reduce our anxiety in this way, the unconscious mind functions autom atically, keeping our autonomous system going without our conscious attention. We tend to act out whatever our unconscious mind tells us. It basically does what it’s programmed to do, and if for whatever reason it has come to believe certain things that are not helpful, then it will sabotage your life rather than help you along. Your conscious mind is the seat of your will power and motivation. The unconscious mind is where your beliefs and confidence reside. If the conscious mind and the unconscious mind are not in harmony, then the unconscious mind always wins in the end. This is why it can be so hard to make lasting changes with will power alone. The good news is that with hypnosis you can easily access the unconscious mind, address distorted or outdated beliefs, create a new self-image and make lasting changes. In many ways it is true that it’s all in the (unconscious) mind. To manifest something in the outside world, it helps to establish a good mental picture first. Imagination is key. “Can anyone be hypnotised?” In principle, anyone with an IQ over 80 can be hypnotised, provided they are not intoxicated. Normally, the more intelligence and imagination a person has the more likely they are to be good hypnotic subjects, although some people are naturally more hypnotisable than others. A small number of people have a tendency to resist hypnotic suggestion, but this is usually due to some reservations or fear about hypnosis. This fear can of course be removed, by clearing away any misconceptions about what hypnosis really is and by establishing a good therapeutic relationship based on trust and mutual respect. For hypnotherapy to be successful, your motivation and a cooperative relationship between us are essential. “Will I be under your control? Will I be unconscious or asleep?” Contrary to popular opinion, hypnosis is not synonymous with sleep, and you will remain fully in control of yourself. You cannot be hypnotised to do anything you do not want to do. Hollywood movies and stage hypnosis shows (which work largely because the hypnotic subjects ar e extroverts who enjoy making a show of themselves) have done much damage to the reputation of hypnosis. Many people still believe those myths and fear what is in fact a powerful force for good when in the hands of someone with good intentions and expert skills. There is no such thing as a battle of wills in therapeutic hypnosis. As your therapist, your welfare is my utmost concern, and in any case, even if I wanted to, I quite simply wouldn’t be able to make you do anything you would normally object to. Nor will you divulge any secrets you would otherwise keep to yourself. Were I to ask you to say anything you would rather keep to yourself or do anything that goes against your moral code, you would naturally object and come out of hypnosis. This is because you will not be unconscious or asleep. And if you were unconscious or asleep, you wouldn’t be able to register my suggestions in the first place. “I can’t remember much about the experience. Will it still work?” Provided you weren’t fast asleep, the answer is ‘absolutely yes!’ This is because it is not uncommon for people to experience post-hypnotic amnesia, a state of being unable to consciously remember suggestions they were given, although they act on them, which means they must have heard them and they must have been retained unconsciously. Much of the hypnotic process is interactive, and I will frequently gauge your response and make sure that you are making progress and not sleeping. “How can hypnosis help me?” Generally speaking, hypnosis can have a lasting impact on your thinking, feeling, and behaviour. It is especially suitable for people who wish to take charge of and accelerate their personal evolution. You might say that all hypnosis is self-hypnosis in the sense that every person has all sorts of unconscious automatic thoughts (self-talk, if you like) that they are not really aware of. The hypnotherapist is essentially a facilitator who helps you identify any unhelpful thought (read: self-hypnosis) patterns that stand between you and your goals and who will use hypnosis to help you eliminate these and replace them with more beneficial suggestions that you have established together beforehand. In this way, provided that you have sufficient motivation to change, significant and durable improvements in your thinkin g and ultimately in your behaviour can be achieved. It depends on your own agenda whether your motivation for having hypnotherapy is rather a motivation ‘away from’ something (such as anxiety, unhelpful habits or emotions) or ‘towards’ something (such as confidence, personal goals or creativity). Ultimately, the result will be the same, i.e. personal evolution, although a motivation ‘towards’ is preferable because it allows you to visualise your goals. It is not uncommon for a motivation ‘away from’ to shift into a motivation ‘towards’ as the therapy develops. Normally we break any complex issues down into manageable chunks and treat them in separate sessions. Many people present multiple issues and feel like they don’t know where to start, but usually there is some overlap, and frequently it is the case that once one issue is resolved this has a positive effect on other issues as well, so that the situation as a whole ought to be reassessed after some progress has been made. “What is working with you like?” Before the actual change work we will have an initial consultation. This is an essential part of the therapy; it is where we lay the foundations and discuss your expectations, goals and motivation. Sessions will be person-centred: they will always be tailored to your specific needs, albeit with the framework set by the therapy goals in mind, since we will remain solution-focused. We normal ly spend some time reviewing and discussing your progress and any cognitive or behavioural ‘homework assignments’ I may have given you previously. I may also do some other therapeutic intervention with you, or teach you specific exercises (such as breathing exercises or self-hypnosis techniques) to equip you with further self-improvement tools. A single hypnotic intervention as such may last anything from 15 minutes to an hour, depending on what it is we are trying to achieve. As I have stated elsewhere, hypnotherapy is not a magic wand – you do not simply come in and ‘go under.’ Rather, following the CBT approach, we will do some interactive work designed to help you get the most out of the hypnotic interventions that follow. I normally record the hypnosis part of your session and provide you with a copy free of charge so you can listen to it again later if you wish to refresh the experience and get even more out of it. “How long will it take to see results?” This really depends on the issue you are seeking help with and on who you are. For most issues, there simply is no one-size-fits-all approach. If a therapist were to claim on their website that the treatment for issue Y will require exactly X amount of sessions, then their treatment plan for you seems to be already fixed before they have even met you. I would be wary of this kind of approach. Most issues can take anything from 2 to 6 sessions to resolve themselves, depending on the issue and on the person. A session with me is typically 1-2.5 hours long, although this is flexible as I don’t normally book clients back to back, so if you feel like you are doing great progress and would like to continue for a bit longer, then you usually can. Of course this is brief therapy, and I like to work fast and effectively, but at the same time I believe some things are best taken sufficient time for. That’s why I don’t normally see more than 2 or 3 clients a day. I like to do things thoroughly and give you my full attention so I can help you as best I can. “Why choose you?” If you compare various hypnotherapists’ websites, you will see that although we all promise to help you achieve your goals and use a similar set of tools, we a ll go about it in slightly different ways. Even though we all ‘do hypnosis’ and even though the issues we offer help for obviously overlap to a very large extent, we all have different personalities and approach issues a little differently as we apply hypnotherapy in different ways, based on our training, experience and personal inclination. I would suggest choosing the therapist whose website and information resonate with you the most. If you feel comfortable with the way I approach a particular issue, then there is a very good chance that you can make much progress while working with me on that issue. Also consider the therapist’s areas of expertise: do they specialise in the area that you are seeking help with? Do they appear to know the issue in depth so they can provide the best possible assistance, or do they offer therapy for everything under the sun in an attempt to broaden their target market? It goes without saying, of course, that if you have heard good things about a practitioner via word of mouth from someone you trust who appears to be doing well, then this is probably the best recommendation for any practitioner! “What credentials do you have?” I studied Linguistics, Philosophy, Psychology and Sociology before graduating in 1999 with an MA in Comparative Literature from the University of London. I also received a Postgraduate Diploma in Education from the University of Luxembourg in 2003. From 2008 to 2010 I studied Clinical Hypnosis and Hypno-Psychotherapy (Hypno-CBT) at the UK College of Hypnosis & Hypnotherapy, where I obtained the Diploma in Cognitive-Behavioural Hypnotherapy. This is the UK’s highest-level national vocational award in hypnotherapy (NCFE level 4) currently recognised by the National Council for Hypnotherapy, approved by the British Psychological Society‘s Learning Centre and accredited by the Register for Evidence-Based Hypnotherapy. I trained directly with Donald Robertson, author of several books about evidence-based hypnotherapy, CBT, and Stoicism. I have also completed the Certificate in the Theory and Principles of Indirect Hypnosis, Ericksonian Psychotherapy and NLP from British Hypnosis Research with distinction under the guidance of Stephen Brooks and the Foundations in Hypnotherapy course of the nationally accredited US-based Hypnosis Motivation Institute (HMI). I have also completed the Certified Advanced Hypnotist training with the American Alliance of Hypnotists and the Certified NLP Practitioner and Life Coach trainings from the American University of NLP, although the truth is that the latter qualifications can be had within less than an hour of paying for it via mouse-click and answering a few simple multiple-choice questions anyone with a mild interest in the subject can answer. Surely, the certificate looks good on my wall and impresses my clients who did not bother reading this, but I found those courses significantly more insightful in terms of what it taught me about business and marketing than about hypnosis and hypnotherapy per se. I am committed to continuous professional development and am currently pursuing Diploma studies under the guidance of Tod Cury at the well-respected International College of Clinical Hypnosis Practitioners (ICCHP), which is validated by the General Hypnotherapy Standards Council (GHSC) and meets the training requirements of the UK Complementary and Natural Healthcare Council (CNHC). In 2014 I completed a 50-hour Certificate of Competence at Scott Sandland’s highly acclaimed Hypnosis Practitioner Training Institute (HPTI), which is recognised by multiple hypnosis organisations, and where I am enrolled for further studies. “I really like the hypnosis relaxation recording I downloaded from your website. Do you have other hypnosis recordings I can download?” I do not currently have any other recordings available for you to download, but I wholeheartedly recommend the recordings available for download at Hypnosis Downloads. These were written and read by reputable therapists who use evidence-based techniques and are very effective. “Do you offer training courses?” I have given presentations and workshops at the Society of Thai Hypnotists in Bangkok together with SMART addiction recovery and problem-solving techniques expert Dr Fariborz Arbasi M.D. (author of ‘Rumi on Change by Love and Reason’), but I do not currently offer training. If you are interested in learning hypnosis, I strongly recommend you seek a reputable school. There are good online trainings available, but I suggest that you make sure you also get hands-on practical live training as online learning is no replacement for actual classes. The theoretical component of the ICCHP course is offered free of charge, so I highly recommend it to anyone who wishes to gain insight into clinical applications of hypnotherapy. HPTI and HMI also offer some free training, so it is a wonderful opportunity to get acquainted with the tools and techniques successful hypnotherapists use and to learn more about how the mind works. Another great place to start learning about hypnotherapy is Hypnosis Downloads, which offers a free video training course and even a number of powerful therapy techniques you can download for free. “Are you a psychologist, a psychiatrist or a psychotherapist?“ It really depends on what you mean by that, and whether I can call myself any of those things depends on the legislation of the country I am practising in. In some countries there are no regulations, so anyone can call themselves a hypnotherapist or even a psychotherapist, regardless of whether they have any training, knowledge or ability whatsoever. I am not, by the standards of most Western countries, a psychologist or psychotherapist because I do not have a degree in psychology and have no license to use hypnosis for any diagnosed medical conditions. I am certainly not a psychiatrist. Psychiatrists are medical practitioners dealing with psychopathology and will typically prescribe psychotropic drugs based on a symptom checklist they run through, working with the American Psychiatric Association’s Diagnostic and Statistical Manual of Mental Disorders or the World Health Organisation’s International Classification of Diseases (DSM-IV). I am neither authorised to formally diagnose anyone nor interested in doing so; I like to work from a perspective of integrative health and wholeness instead. 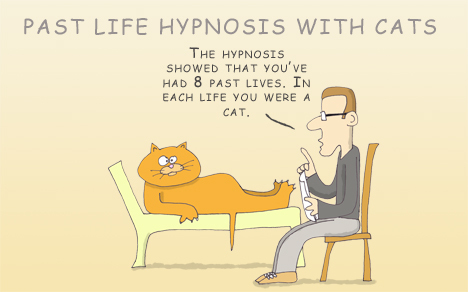 I have in-depth knowledge and understanding of hypnosis, including curative and health-enhancing applications. Whether you prefer to consult a ‘lay’ hypnotherapist like myself who has developed his skill from regularly using hypnosis as his main therapeutic tool in combination with a number of fast and effective psycho-therapeutic interventions, or whether you prefer to see a fully licensed postgraduate psychologist or a medical doctor whose medical toolkit also includes hypnosis, really depends on your personal needs and preferences. “Do you offer any guarantees of success?” I offer a time-limited 100% money-back satisfaction guarantee for 1-session smoking cessation because this is a pretty straightforward process. With any other issues, success isn’t quite as easy to measure and largely a subjective experience. I care deeply about what I do, and I assure you that I will take you seriously and not judge you. You will have my undivided attention, and through asking you many questions I will do what I can to understand where you are coming from, what you want to achieve and what success looks like for you. In return I expect honesty from you. The more I know about why you are coming to see me the more I can do for you. “Is any personal information you know about me confidential?” Anything you tell me remains confidential unless there is the possibility of self-harm or harm to others, or if there are court orders. I abide by the Code of Ethics of the National Council for Hypnotherapy, a UK-based hypnotherapy register of which I am a member. “I’m worried that I might be vulnerable while under the influence of hypnosis. Can I bring someone with me to the session so I feel safer?” Of course, you are welcome to bring someone with you if you feel more comfortable that way. Although in hypnosis you won’t be divulging any secrets you would normally keep to yourself you need to be aware that anything you choose to tell me will also be heard by anyone you bring with you. “What kind of people come to see you?” Hypnotherapy can benefit people of all ages and from all walks of life. People from many countries across the globe, both male and female, choose to have hypnotherapy with me. While I was working in South East Asia, many of them were expat residents, although I had local clients too. While working in Thailand, which is world-renowned for its high influx of medical tourists, many clients also combined a holiday in Thailand with the opportunity to have hypnotherapy sessions. I have helped salespeople, teachers, researchers, students, a journalist, investors, company executives, managers, team leaders, a financial advisor, counsellors and therapists, writers, comedians, lawyers, flight attendants, webmasters, graphic designers, musicians, models, actors, escorts, managers, entrepreneurs, nurses, development workers, homemakers, a chiropractor, a librarian, a diplomat, a physicist, retirees and many more. “Why do you not have any testimonials on your website?” I do not use testimonials because they are too easy to fabricate. The British Advertising Standards Agency does not condone the use of testimonials on hypnotherapy websites for this very reason. Although, being outside of the UK, I am not legally bound by those restrictions, this makes sense to me. “Do you do regression therapy?” As I have stated elsewhere, I do not regress people into their childhood to retrieve inaccessible traumatic memories. I work from a practical here & now perspective that is solution-focused, and I do not see how anyone seeking solutions can benefit from dwelling on the past, digging deeper and deeper into the possible roots of their current difficulties with life. I believe that this more often than not only exacerbates the problem. Most people do not get better from obsessing with the past, but they do get better by taking heart and embracing the present moment and their thoughts, emotions and behaviours within it. The godfather of modern psycho-analysis, Sigmund Freud, only ever treated some three dozen people in his lifetime, and most of them were lifetime patients. Hardly any of them got better. This is often true for psycho-analysts today, many of whom continue seeing the same 30 or 40 clients repeatedly throughout their lives. Hypnosis may well speed up the regressive process, but the path does not come without dangers: there is a risk of having abreactions from reliving truly traumatic memories, real or imagined! If you do not believe me, I suggest you look into the reality of false memory syndrome, particularly in the retrieval of supposed child sexual abuse memories. It should also be of concern to you that, precisely because of this very real risk, in many countries court testimonies will have no legal weight if the witness was hypnotised. This is why I will only ever work with memories that are already present prior to hypnosis, and then only to reframe them by, for example, doing inner child work, which is very life-affirming and healing. The only other time I may use regression is to specifically tap into any positive memories you may have, and into the positive, empowering emotions and attitudes you had during those times so you can access and reactivate them for use in the here & now. Consider the fact that our memories are by their very nature unreliable and very much tainted by our present mood. Do you remember recalling a specific past experience whilst feeling very happy even though you clearly remember remembering it differently whilst feeling blue at another time? This distortion of what happened in the past is what we must guard against if we wish to discover truth, although of course it can be a great ally when it comes to reframing past events in a more positive way by using our natural ability to do so. You really are limited only by your imagination. “What about past-life regression?” Many people contact me wishing to use hypnosis in order to do past life regression. While I am a firm believer in the law of karma and the wheel of reincarnation, and while I treat these spiritual and cultural traditions with the respect that is their due, I do not actually offer past-life regression as a form of therapy – for the simple reason that there is absolutely no credible evidence that the visions gleaned during such mind/soul excursions are in any way memories or remnants of past lives. Numerous therapeutic claims are being made for past-life regression therapy, and the list is as extensive as that for psycho-analysis. I personally believe that the insights begotten during such explorations are about as arbitrary as those of psycho-analysis, except that they remove the root cause from one’s present life and transpose them outside of one’s present physical existence. Although spiritually no doubt very valuable and insighful, I believe that it is just as likely confabulation than not. They could be scenes from early childhood, or from something one has read, heard or even dreamt about or has seen in a film. Of course, it may just be true that once in a while the images a person relives truly are of past lives, but it might just as well be something they imagined. Or perhaps they were tapping into the collective unconscious, which is another possibility – very intriguing, but of little to no value when it comes to brief and effective therapy designed to help people get on with their lives. The bottom line regarding the validity of past-life regression is: “wh o knows?” Just like with any form of regression therapy, I would like to draw your attention to the very real phenomenon of false memory syndrome. I understand that in different cultures these things are viewed in different ways, and I am respectful of all cultural values and ways of seeing things. However, I would be wary of anyone offering past life regression as a therapeutic tool to help you solve any difficulties in your present life. For instance, if you are looking for a solution to a relationship issue or to lift your depression, I would definitely not do any past-life regression with you because I would deem it irresponsible to do so. In evidence-based therapy circles, one would speak of malpractice. The person seeking help for such issues would be much better off finding effective ways of dealing with the here & now than having the added psychological load of a past existence. If you cannot cope with life now, how would adding another lifetime or trauma lighten the weight on your shoulders? That said, I am actually very open to and interested in past-life explorations, and I have done some myself, so I have a little experience with it. So I do offer past-life regression for anyone simply seeking an exploratory spiritual journey, keeping in mind that it is not ther apy! I will only offer such services to well-balanced people who treat this as a novelty exploratory tool with much potential and who can take what they experience with a grain of salt rather than looking to solve problems only to find that they suddenly have more on their plate than before. All that being said, you can easily find other practising hypnotherapists who will gladly offer past-life regression to anyone who requests it, for any purpose. By all means, go ahead – some of them are very experienced and probably much more skilled at this particular service than I am – but always keep in mind that what you will experience is just as likely as not merely a projection of your own mind, based on your expectations, experience, and the suggestions of the hypnotist you are working with. My advice is to make sure you can tap into your capacity to enjoy it and don’t take any of it too seriously. It’s very much about the imagination. “What about hypnosis for astral travel?” I do offer hypnosis for out-of-the-body experiences for those so inclined, beca use I have had some experiences with mind-body dissociation myself and am aware of the spiritual potentialities. But as with past-life regression, I treat this firmly as an exploratory spiritual tool, not as a therapeutic service. In my experience, the more you can allow yourself to visualise and trust that you will come back and are willing to let go of the worldly concerns of your ego the further into the astral plane you will be able to go. To the extent that each and every one of us really does create their own reality, it is obvious that the more you remain calm and confident the more you will be able to harness the power of your imagination so you can see more clearly and the easier you will make it back into your body and your worldly identity in one piece.